Perpetrators of a theft which occurred in August are still at large. Merrick, NY - Nov. 13, 2013 - Crime Stoppers and the Nassau County Police Department are seeking the public’s help with identifying the above pictured unknown subjects. The subjects are wanted in connection with a Grand Larceny that occurred in Merrick, New York. On Wednesday August 14th, 2013 between 7:00AM, and 8:00 AM unknown person(s) broke into the victim’s vehicle while they were working out at the Extreme Gym located at 2119 Merrick Rd in Merrick, NY. The unknown person(s) removed the victim’s pocketbook and contents. 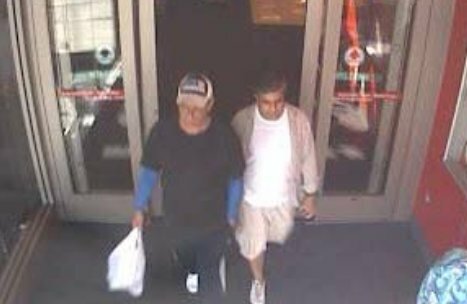 The unknown subjects pictured above were later caught on video surveillance making a fraudulent purchase with one of the victim’s stolen credit cards at Target located at 999 Corporate Drive in Westbury, NY. The subjects fled in a green or blue beat up pick-up truck with a chrome ram bar on the front, and chrome running boards, unknown plate number. Crime Stoppers is asking anyone who can identify the subjects pictured above, or anyone with any information about this case to call our toll free hotline: 1-800-244- TIPS (8477). Subject: LongIsland.com - Your Name sent you Article details of "NCPD Seeking Public's Help in Merrick Grand Larceny Case"